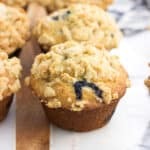 These are the best blueberry crumb muffins! They're tender, bursting with fresh blueberries, and feature an easy crumb topping that takes this baked good favorite over the top. Preheat oven to 400°F. Generously spray a 12-cup muffin pan with cooking spray and set aside. Rinse blueberries and take care to pat them as dry as you can. Add them to a bowl and sprinkle flour over top, tossing them several times to evenly coat. (I used about 1 1/2 teaspoons). Set aside. Add 2 cups of flour, brown sugar, baking powder, baking soda, salt, ground cinnamon, and ground nutmeg to a large mixing bowl and whisk to combine, breaking up any lumps. Add melted butter, milk, eggs, and vanilla extract to a medium mixing bowl and whisk until smooth. Pour wet ingredients into dry and stir until just combined. It's okay if a few lumps remain. Gently fold in flour-dusted blueberries. Evenly disperse muffin batter amongst the twelve muffin cups. Prepare the crumb topping and scatter evenly over the muffins. Bake for 18-20 minutes, or until the tops are golden brown and a tester inserted into the tallest part of the muffin comes out clean. Let muffins cool in the muffin pan for a 10-15 minutes, then carefully remove to a wire rack to cool completely. Dust with confectioners' sugar for serving if desired, and store in an air-tight container. I rarely have buttermilk on hand, so I make a quick and dirty version with regular milk and vinegar. For this recipe, add 2 tsp of white vinegar to a measuring cup and pour in milk (I used 2%) up to the 2/3 cup marking. Give it a stir and let it sit for at least five minutes before adding to the recipe.